As well as being a big year in music, 1987 saw significant developments in music TV in Australia. While Countdown was just months away from airing its final episode, Video Hits had recently started on Channel 10, and rage and MTV were about to launch. This week in 1987, a song that would end up being used as the theme song for one of the new music shows made its debut on the ARIA singles chart. It was also the first major hit for an artist who'd only recently broken into the top 50 for the first time in his lengthy career. Two artists who'd had no shortage of hits in their careers were together at number 1 this week in 1987. Aretha Franklin and George Michael jumped to the top with "I Knew You Were Waiting (For Me)", which would spend four weeks there. The Wild Frontier album would finally provide Gary Moore with his long-awaited solo hit in Australia, but it wasn't with this Celtic-sounding lead single. British band Big Supreme never really got off the ground here or at home despite releasing great pop singles like this and follow-up "Please Yourself". After a decade-and-a-half of releasing fantastic funk singles, Kool & The Gang finally landed a big hit in 1985... with a ballad. It was back to the chart doldrums with this lead single from Victory. Also this week, "Blue Monday" by New Order returned to the top 100, no doubt thanks to the runaway success of "Bizarre Love Triangle". It added nine more weeks to its tally, but didn't get any higher than number 69 this time around. Over the years, Australian record companies have often found themselves with a choice of what to release locally - the US single or the UK single. 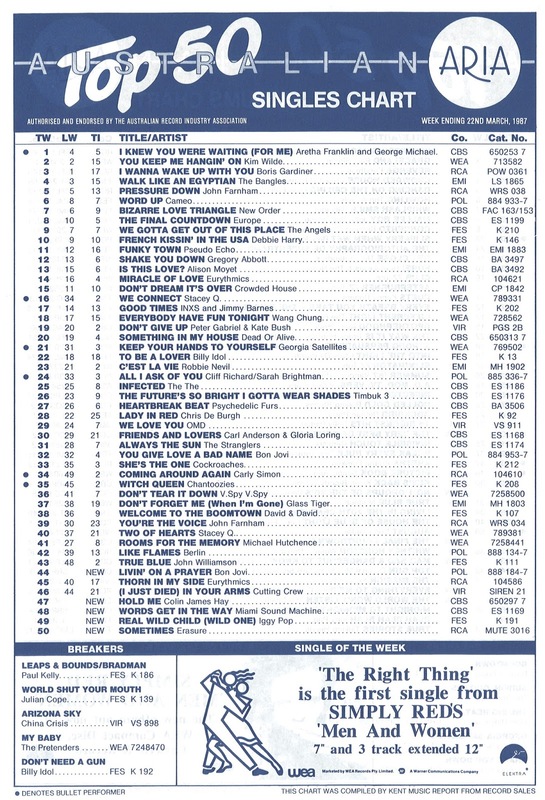 In the case of The Pretenders, there was a choice between "My Baby", which reached number 64 at the start of the month in America, and UK top 10 hit "Hymn To Her". Australia went with the former, which sounded like the type of radio-friendly song that would do well here. Unfortunately, "My Baby" would prove to be a disappointing follow-up to "Don't Get Me Wrong", placing The Pretenders outside the top 50 once again. As for "Hymn To Her", well, it would get a much better reception in a few months' time. Here's another single you'd expect to have done better on the chart - if not for one reason then certainly for another. Like "Before Too Long" and "Darling It Hurts", "Leaps And Bounds" is one of those songs you only have to hear once before you're singing along. A classic Paul Kelly composition, it dated back to his days with The Dots alongside co-writer Chris Langman. Years later, it wound up on the Gossip album, which had been a top 50 fixture since September - a fact that possibly explains why the single didn't do so well. The other reason why the single peaked surprisingly low is because it featured a previously unreleased double A-side - and it was a song about an Australian sports legend to boot. Yes, with its spoken verses and lengthy running time, "Bradman" didn't have hit written all over it in the way that "Leaps And Bounds" did. But surely it was unpatriotic of Australians not to have bought it in droves. Australia may have been one of the countries to give Erasure their first hit with "Oh L'amour" in 1986, but just as the synthpop duo finally started having some success at home in the UK, we lost interest. "Oh L'amour" and the other two singles from debut album Wonderland had flopped in Britain, but Vince Clarke and Andy Bell completely turned things around with "Sometimes", which almost topped the UK chart. Locally, the pop gem - which was one of my favourite songs for 1986 - scraped into the top 50, somewhere Erasure wouldn't return until they helped bring about the ABBA revival in 1992. 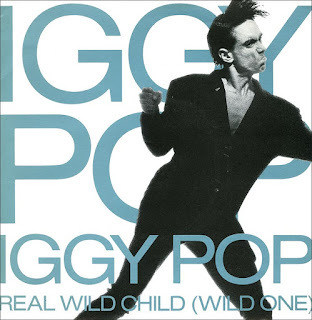 He'd recently skirted the very bottom of the top 50 with "Cry For Love", but Iggy Pop really made his presence felt on the chart with the second single from Blah-Blah-Blah. A synth-rock cover of "Wild One", the 1958 song by Johnny O'Keefe that became the first Australian rock'n'roll hit, "Real Wild Child (Wild One)" was always going to have special resonance locally. But when the track was used in the theme for ABC's all-night music program, rage, it became a permanent part of Aussie pop culture. Thirty years later and not only is rage still on air, but "Real Wild Child (Wild One)" continues to be heard mixed in with someone screaming "Rage!" every Friday and Saturday night. From an artist who took ages to land his first big hit single, we come now to a song that took its sweet time to reach the top 50. The first ballad hit by Miami Sound Machine, "Words Get In The Way" had debuted in the top 100 in mid-October, spent a couple of weeks on the chart then disappeared until mid-January. Nine weeks later, it enjoyed a three-week run in the top 50 before just as slowly making its way out of the top 100. Unlike in the US, where it reached the top 5, "Words Get In The Way" may not have done as well as "Dr Beat" and "Conga" in Australia, but its ultimate tally of 27 weeks on the top 100 was not too shabby. With the dramatic decline in success for Men At Work's third album, Two Hearts, it was little surprise the world-conquering band went their separate ways at the end of 1985. For singer Colin Hay, that meant embarking on a solo career. Released under his full name, Colin James Hay, debut single "Hold Me" certainly sounded like a hit waiting to happen, with its busy production courtesy of Robin Millar (Fine Young Cannibals and Sade's Diamond Life) and on-trend world music backing vocals. Alas, it was not meant to be, with "Hold Me" scraping the bottom of the top 40 and accompanying album Looking For Jack missing the top 50 altogether. The song remains Colin's only top 50 single despite a solo output that continues until this day. As we saw a few weeks ago, "You Give Love A Bad Name" nudged open the door for Bon Jovi in Australia (and this week sat at its peak of number 32). Well, follow-up "Livin' On A Prayer" kicked the door off its hinges, zooming into the top 10 by the end of April, spending eight weeks among the 10 highest selling singles in Australia and winding up as the year's 17th biggest record. Once again, the track was co-written by Jon Bon Jovi and Richie Sambora with Desmond Child, who brought some of his life history to the table. Tommy and Gina, the working class couple described in the song's lyrics, were partly based on his pre-success experience with his girlfriend at the time, Maria Vidal (of "Body Rock" fame). The characters were also representative of the band's fans - hard working people trying to make ends meet. With a subject matter as relatable as that, it unsurprisingly became Bon Jovi's second US number 1 on the trot. Musically, "Livin' On A Prayer" upped the ante set by "You Give Love A Bad Name". From its dramatic opening featuring Richie Sambora on talkbox, the song built and built until that key change at the end - a climax represented visually by Jon flying through the air in the music video, reaching notes it's best not to try at karaoke (yep, I've had a hoarse voice the next day after attempting it, too). Rock rarely gets more pop than this. Next week: the year's sleaziest number 1 single arrives, as well as another single from the unstoppable Whispering Jack and two soundtrack hits. Ah, Iggy Pop and the Rage theme...inseparable. At least the bloke kept his shirt on. I'm pretty sure I wasn't aware of either rage or Video Hits until early 1988; I think I was more interested in Saturday morning cartoon shows before then. I heard the Gary Moore song on the rage tribute after his death; it's probably my favourite track of his I've heard. How strange that 'Blue Monday' charted again. Would record companies have had surplus stock lying around from 1983? I think not. It must have been re-printed due to 'demand'. 'Leaps and Bounds' probably would have done better if it had been titled 'I Remember'. I prefer 'O L'amour' to 'Sometimes'. 'Livin' on a Prayer' is a great track, but the overuse of 'oh' and 'woah' as chorus lyrics is slightly irritating. In some ways the video epitomises the 80s. The audio used by Vevo for this video seems to be a slightly different mix to that which was originally used (or it's missing some audience cheer).